Net WT. 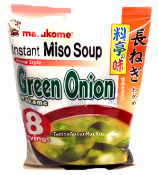 5.5 OZ(155g) Paste Style 8 Servings Ingredients: Rice miso, Filtered water, alcohol. bonito extract , bonito powder, kelp extract, hydrolyzed protein extract, sea salt, disodium inosinate, disodium guanylate. Ganish packet: Dried wakame seaweed, dried green onion, flavour enhancer, bonito powder.